I really rather liked LEGEND OF THE GUARDIANS: THE OWLS OF GA'HOOLE. It is a beautifully animated, brilliantly voiced, old-fashioned story in the manner of WATERSHIP DOWN. Moreover, it is blissfully absent of the sort of post-modern wit that propels the SHREK franchise. What's even more astonishing is that it was directed by Zack Snyder - purveyor of visually lush but morally vacuous, if not morally objectionable, fare like 300 and SUCKER PUNCH. The protagonists were sympathetic and endearing and their adventure story more compelling than any plot description would suggest. The story is based on the Guardians of Ga'Hoole books by Kathryn Lansky books, and this film focuses on two young owls, Soren and Kludd, who are kidnapped by some nasty racial purist owls. Luckily Soren is taken under the wing of a fellow inmate and taught how to outwit his captors and to eventually seek out the Jedi like Guardians who can teach him how to use his Gizzard and "save the world". If this sounds very STAR-WARS then it succeeds for the same reasons that Star Wars succeeds - it's a classic Saturday Morning Adventure Serial with good triumphing over evil, framed as a coming-of-age story. 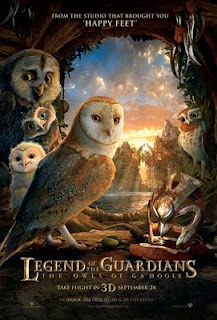 LEGEND OF THE GUARDIANS: THE OWLS OF GA'HOOLE went on global release in autumn 2010. It is now available to rent and own.